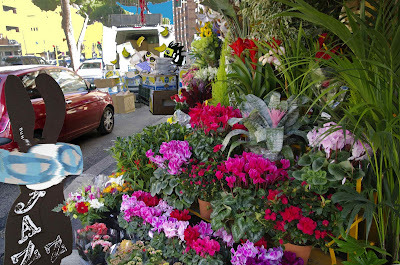 "Say it with flowers," said the Wabbit to himself as he passed the flower kiosk. He had decided that Lapinette would appreciate some seasonal blooms and he studied all the plants and flowers with interest. "I wish I knew more about botany," he murmured. The Wabbit tended to choose flowers by colours and correspondingly he had found a list which categorised plants by colour. Green presented a considerable difficulty in this regard, so had divided green into all the different shades that existed. He particularly liked Army Green and Jungle Green, but shopkeepers were nonplussed when he asked for them. So he took pity and was asking for Fern Green when he heard a chattering noise and smelled a vaguely familiar odour of wine. Then there was a clattering of boxes and a strange commotion from behind him made his head turn. Bananas were flying everywhere and to his horror he saw Lapinette being dragged into the back of a grocer's van. "Skuttles!" shouted the Wabbit. He hopped furiously towards the vehicle but it took off into the busy traffic and sped off. "I thought they only drove by night." muttered the Wabbit. But the Wabbit knew one thing. He knew that Lapinette would have a plan and wouldn't stay captured for long if she could help it. And she would expect him to know what her plan would be. So he abandoned his greenery and as he hopped across the market place to gather support, he tried desperately to think like Lapinette. "My brain hurts," thought the Wabbit.